A Number field is used for entering numbers and will only pass validation if the value entered is a number that falls within the designated range and step settings. 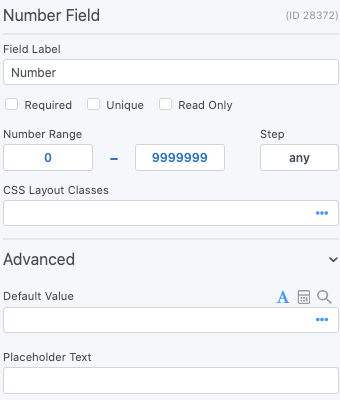 In addition to the standard field options, Number fields have a 'Number Range' option. Read more about this option below. This option is for browsers that support the HTML 5 number field. Enter the minimum and maximum values for your number field. The step setting will affect the types of numbers that are accepted. If you want to allow all numbers, including decimals, enter 'any' in the 'step' box. If you want to accept only whole numbers, enter 1 in the 'step' box. These settings will only apply if the 'Use HTML5 in forms' setting is checked in the 'Formidable' → 'Global Settings' under 'Styling & Scripts'. You may set a dynamic default value in your Dropdown field. If you would like to retrieve a value from an entry see the Get a Value From an Entry page. If you would like to set a default value with one of our dynamic shortcodes, see the Default Values page. The default value icons can be used to specify whether the text in the box on the form builder page should be a default value or a placeholder. Learn how to set a default value, and how to set a placeholder in a text field. Field action icons allows you to duplicate, delete, and/or move a field on the form builder page. See field action icons for more information. Display the value submitted in a Number field in a form's confirmation message, email, or View. Display the value submitted in a Number field. Replace x with the ID or key of the Number field. Determine how many decimal places should be included in the displayed number. Determine which character should be used as the decimal point in the displayed number. By default, this will be a period. Determine which character should be used as the thousands separator in the displayed number. By default, this will be a comma.